Elderly Woman Went Into Freezing Cold To Save Husband. They Died. "The kind and loving husband and father suffered from a massive heart attack," an obituary read, "and his loving and supportive wife died trying to save the love of her life." In a yellow-brick farmhouse, down a rural road in southwestern Ontario, Grant and Ada Triebner lived a quiet life together. A collection of family photographs offers glimpses into their decades-long marriage: Ada, posing in her white, lace-trimmed ballgown and Grant in his suit on their wedding day. The smiling couple holding children, then grandchildren, in their arms. Ada and Grant sharing a kiss for the camera in their later years, their graying hair a testament to the durability of their love. Grant playing the violin, riding a motorcycle, or driving a tractor around their property. 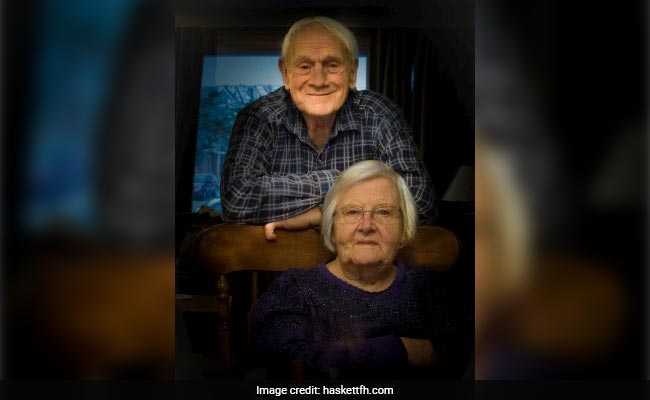 It was outside their beloved farmhouse in the small municipality of Bluewater, after a bitterly cold night last week, that Grant and Ada Triebner died together within hours of each other, police told Canadian news outlets. Grant Triebner was found dead inside an open barn on his snow-covered property Wednesday morning, having suffered a fatal "medical event," provincial police told the Canadian Press in a statement. Wanting to check on her husband, police said, Ada Triebner stepped out of her farmhouse and into the frigid cold, amid temperatures that dropped to about 14 degrees Fahrenheit. She died from exposure to the extreme cold, police said. Police found the couple during a welfare check at about 9 a.m. Wednesday morning and released their causes of death on Thursday. Their deaths came amid an "unseasonable deep freeze that's gripped Southwestern Ontario," local newspaper the London Free Press reported. The tragic ending stunned members of their small rural community. But their story also reached strangers far beyond Ontario, underscoring the dangers of the unusually cold temperatures sweeping across Canada and the U.S. The municipality of Bluewater mourned the deaths of the Triebners on Facebook, and warned residents to help safeguard their neighbors during this time of extreme cold, "particularly those who are elderly, with health issues, or simply living alone." "Let's blanket this community with all the warmth Bluewater is capable of and keep each other safe," the municipality posted on Facebook. Relatives described the Triebners as an inseparable couple that loved their church, their family and their home. Before they both retired, Ada Triebner worked as a schoolteacher, and Grant Triebner as a cash crop farmer, their longtime neighbor Jim Rowe told the London Free Press. Grant Triebner also drove a school bus, and many of his long-ago students shared memories of him in condolence notes on the funeral site. "Grant was my bus driver for years," a note from Jackie Westelaken reads. "He was a kind man with a great sense of humour. We always had nice chats as I was often the last to be dropped off." The couple lived "unencumbered in a world that sometimes has an appetite for greed," their niece, Ethel-Lori Triebner, wrote in a tribute in the London Free Press. Through the years, they took care of each other, overcoming the death of their son, Mark, in 1987, to cystic fibrosis. A family friend, Annette Gilbert, recalled in a condolence note on the funeral home site how Grant Triebner would be "joking, teasing and singing while doing Mark's therapy," and how Ada Triebner would be "busy at the wood stove just trying to keep us out of trouble." "What a privilege I didn't recognize as a child to have spent time in the home of such a resilient couple," Gilbert wrote. "Our families have been connected from the 60s through sad times and happy times," another family friend wrote on the funeral site. "(Now) your parents are with Mark who welcomed them with open arms and his devilish grin so like your Father's grin." Rowe, the couple's neighbor, remembered Triebner as an active lover of the outdoors. He was "always building something" and could play several instruments, Rowe said. He could often be found outside, riding his bicycle in the summer or clearing snow out of the driveway in the winter. He was "always fiddling with something, he was a master at building things, or working on a motor or making something work or getting an old tractor to run," Rowe said. Most of all, their relatives and friends recalled, the couple showed a devotion to their faith and to each other. Martha Heywood, a member of their church, told the Toronto Star that Grant had medical issues and Ada "suffered a little" from dementia. "He was determined that he could take care of Ada as she had taken care of him all those years," she said. A niece, Elizabeth Jolly, described Grant Triebner's "mischievous nature" and Ada Triebner's "gentle serenity." "We so loved listening to Uncle Grant's wonderful tales of days gone by, his boisterous laugh and to Aunt Ada saying "Oh, Grant!" recounted another relative. "They were, to us, an amazing example of how a marriage should be. They very obviously adored each other." "They never did much apart from each other," Rowe said. "They were so close, together all their lives." Their funeral service will be held this week, and the couple will be buried at the cemetery just down the road from their house. They will share the gravestone with their late son, Mark. The marker, arranged before they died, is inscribed with a reference to a bible verse: John 11:25. "I am the resurrection and the life. The one who believes in me will live, even though they die."